1- With a stainless steel, steamer basket, placed in a pot with lid, bring a few inches of water to boil. Add green/yellow beans and reduce heat and steam for about 7 minutes. 2-Meanwhile, in a small saucepan, heat olive oil until hot, and add garlic. Watching closely, and stirring, allow the garlic to brown slightly, and then take off of the heat. 3- Add the vinegar, and some salt (about 1/2 teaspoon) and freshly ground pepper. 4-In a pretty bowl, place the steam green beans and the basil. Toss with the garlic oil and vinegar dressing. Adjust the flavors with salt, oil and vinegar as needed (which shouldn’t be much) and serve. 1 bunch fresh beets, cleaned, peeled, steamed or boiled and sliced OR 1 can beets, drained and rinsed and warmed and sliced. Saute garlic in olive oil – cook 3-5 minutes, Toss kale in skillet – cook til begins to wilt. Warm beans in small saucepan over low heat. Preheat oven to 425 degrees. If using small beets, cut them into 1 to 1 ½ inch wedges. If using small beets, peel beets. Baby beets do not need to be peeled. Place beets in single layer in shallow baking pan. Drizzle with 1 tbsp olive oil. Toss to coat. Sprinkle with salt and pepper, toss to combine. Cover with foil and roast for 25 minutes..uncover and roast about 15 mins more or until beets are tender. Cool. Meanwhile, using sharp knife or citrus tool, remove long shreds of peel from orange, take care not to remove white pith…measure 2 tbsp peel. Squeeze juice from orange, measure 1/3 cup juice. In glass dish, whisk together the 1/3 cup OJ, remaining 1 tbsp oil, vinegar, shallot and mustard. Add beets and orange peel. Toss gently to combine. Cover and marinate at room temp for 30 mins or in refrigerator for up to 8 hours. Preheat oven to 400 degrees. 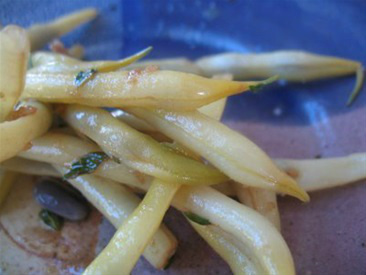 Trim ends of beans and place on baking sheet – toss beans with olive oil and spread evenly on sheet. Roast for 8 minutes, then add pecans and shallots and continue roasting another 5 minutes or until beans are lightly browned and crisp tender. Remove from oven and sprinkle with oregano and black pepper before serving. Cut off beet tops about an inch above the beet. In large pot, cover the beets with 3 inches of cold water and bring to boil. Cover and boil over medium heat until tender about 45 minutes. Drain beets under cool running water. Slip off skins. Trim off stems and root ends and slice thinly. Combine sliced beets in a bowl with other ingredients, add salt to taste and chill. Stir several times. Keeps for one week in refrigerator. Wash beans, trim ends and remove strings. Bring ½ cup water to boil in large saucepan. Add beans, cover, reduce heat to medium and cook 10 minutes or until tender. Drain, set aside, keep warm. Saute onion and garlic in olive oil over high heat for 5 minutes or until crisp tender. Stir in tomatoes and wine, bring to boil. Reduce heat and simmer uncovered, 20 minutes stirring occasionally. Stir in olives. Spoon sauce over green beans. Pour lemon juice over sauce, sprinkle with pepper. In a large skillet, heat 1 tbsp olive oil and saute Swiss chard for 2 minutes. Remove from skillet and set aside. Add remaining 1 tsp olive oil to skillet and saute eggplant and garlic for 2-3 minutes, Add mushrooms and saute until well browned, 7-9 minutes. Add sauteed Swiss Chard and cook for 1 more minute. While vegetables are being sauteed, cook pasta according to pkg directions then drain water. Toss hot pasta immediately with the mozzarella and Gorgonzola. add in sauteed vegetables and season with pepper. Bring ½ cup water to boil in large pot over med-hi heat. Gradually add greens, stirring them down with each addition, When all greens have been added and are well wilted, add raisins, partially cover the pot and reduce heat to medium. Cook, stirring occasionally and adding more water if necessary until greens are very tender about 20 minutes. Meanwhile combine the oil and garlic in skillet and cook over medium heat until garlic is soft, about 3-4 minutes. Stir in pine nuts, remove from heat and set aside. In small bowl, toss onion and salt and set aside. When green are cooked, pour off any remaining liquid without draining thoroughly so greens remain moist. Stir in the vinegar and garlic oil./ Transfer to a serving dish, arrange wilted onions over the top and serve.